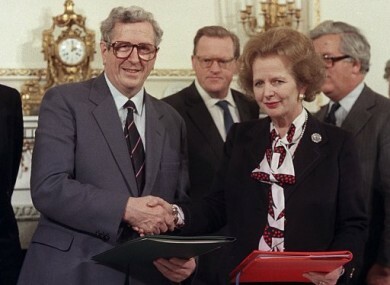 Taoiseach Garret FitzGerald shakes the hand of Britain's Prime Minister Margaret Thatcher after signing the Anglo-Irish agreement. MARGARET THATCHER’S GOVERNMENT considered changing the border in Northern Ireland to bring some predominantly Catholic areas into the Republic of Ireland, British state papers have revealed. The Financial Times reports (subscription needed) that the proposal was discussed by the UK cabinet to “produce a more homogeneous population in Northern Ireland”. The documents laid out negotiations between the Irish and British Governments in the run up to the 1985 Anglo-Irish agreement with the FT reporting that they detailed a “pessimistic tone” about whether a deal could be done. “The Irish want more than we can give and always will. I doubt whether we shall find a way forward,” Thatcher is reported to have said. The Guardian is also reporting the former Taoiseach Garret FitzGerald had considered holding a referendum to give up the Republic’s constitutional claim on Northern Ireland in return for a number of concessions. The proposed compromise included reforms of the Royal Ulster Constabulary (RUC) and the introduction of north-south “mixed courts” with judges drawn from both sides of the border. But continued violence hampered negotiations between the Irish and British Government’s, with the IRA’s 1984 bombing of the Brighton Hotel during the Conservative conference almost derailing talks completely. Email “Thatcher considered redrawing NI border to move Catholic areas south”. Feedback on “Thatcher considered redrawing NI border to move Catholic areas south”.